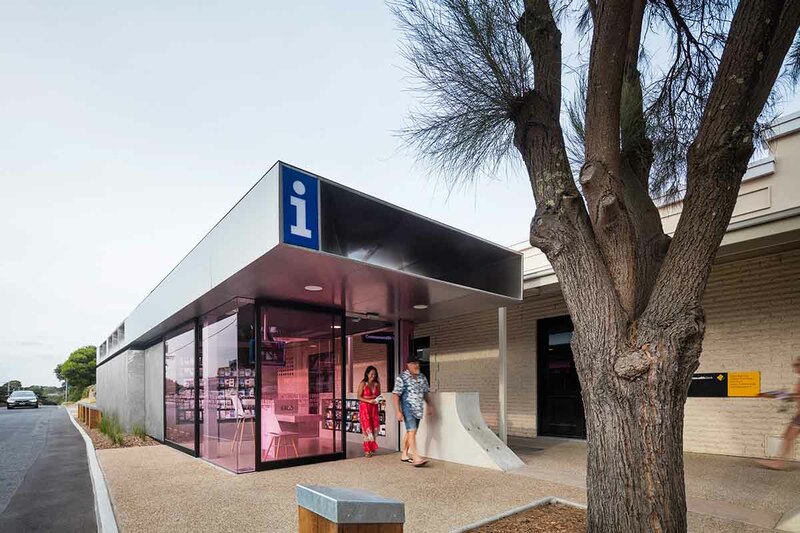 A combination of urban design, sculpture and architecture, this visitor information building creates new spaces for the public life of Sorrento. 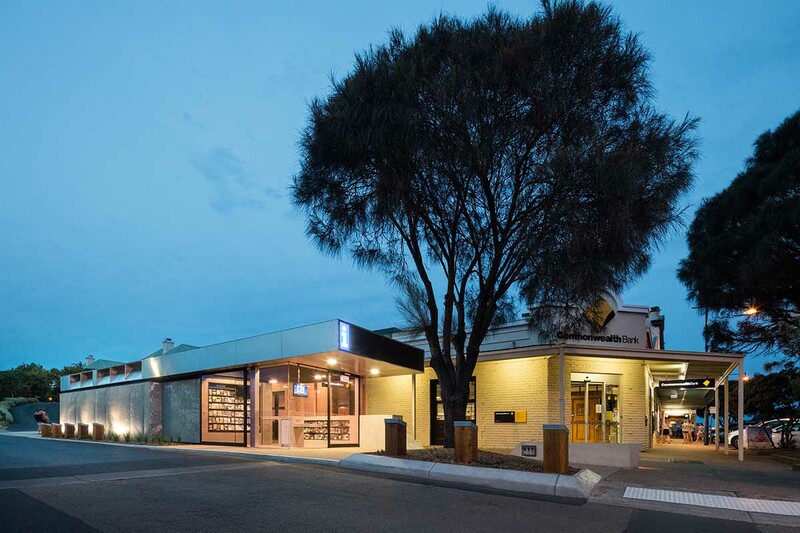 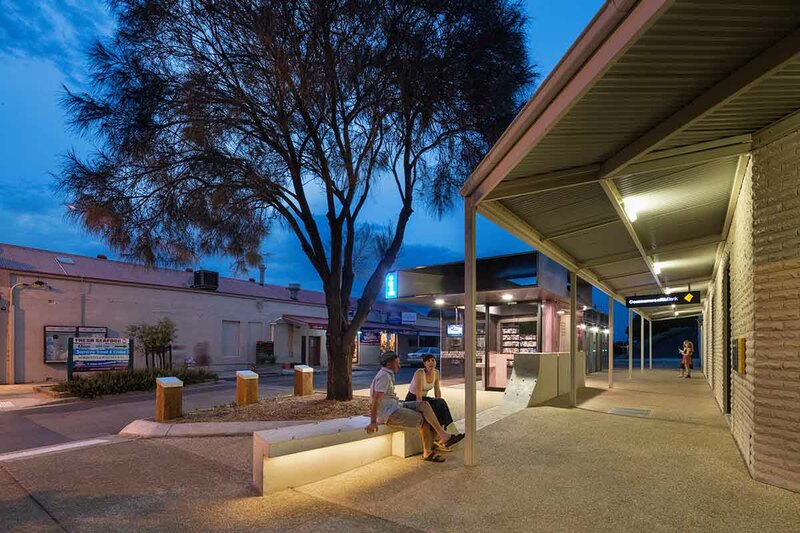 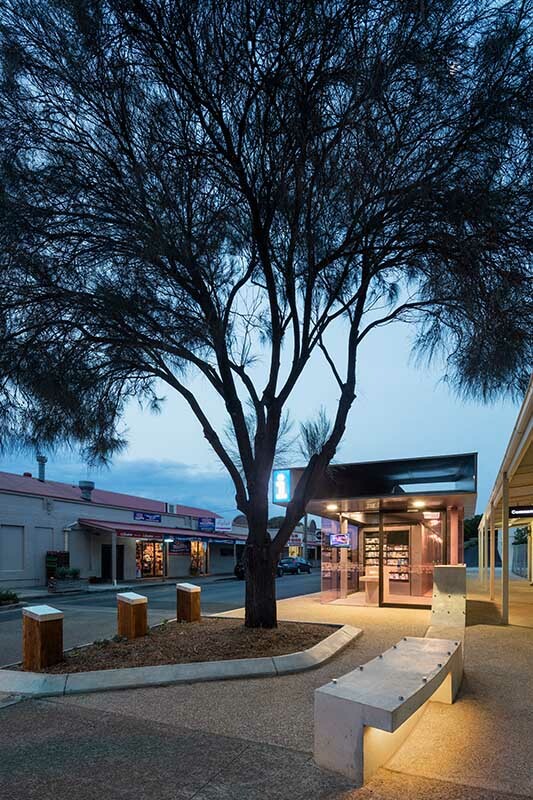 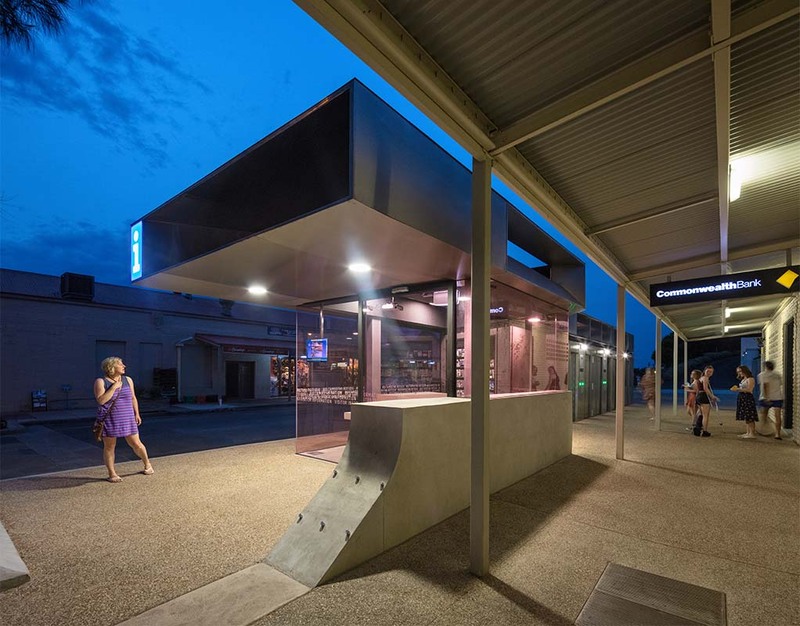 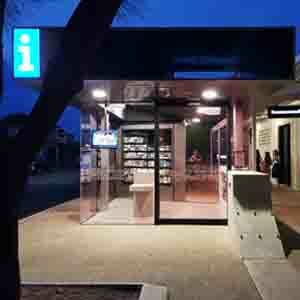 Located at the intersection of its main street, Ocean Beach Road and the smaller George St, it forms part of a streetscape renewal project that extends along the town centre, and replaces an existing, aging public toilet facility and information kiosk.The community expectations for this the project were that it be more than what it was; it should not only contribute strongly to the urban design of Sorrento but also have a civic role, communicate something about the town in its public setting. 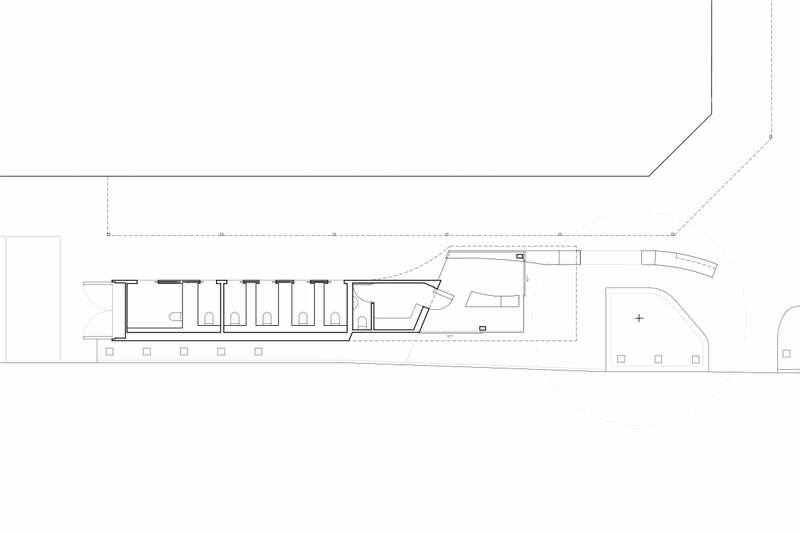 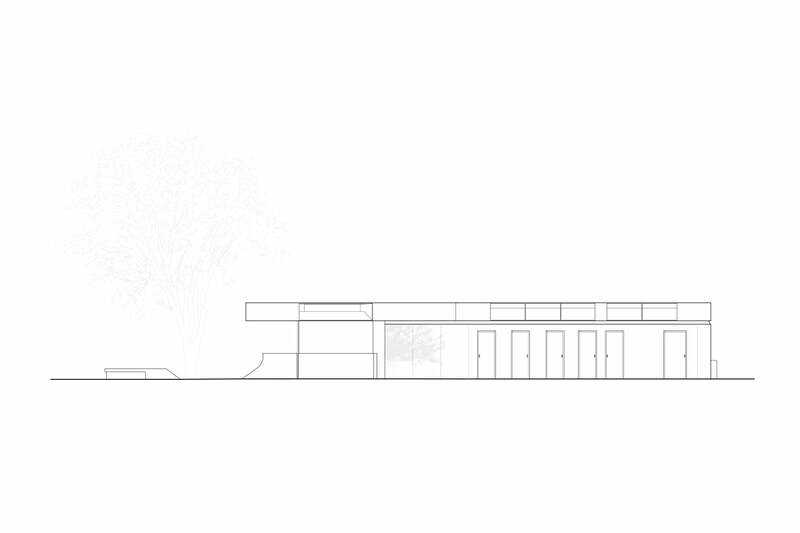 To us this was a problem of scale and of limit – a conceptual problem of how to make a small building ‘bigger’. 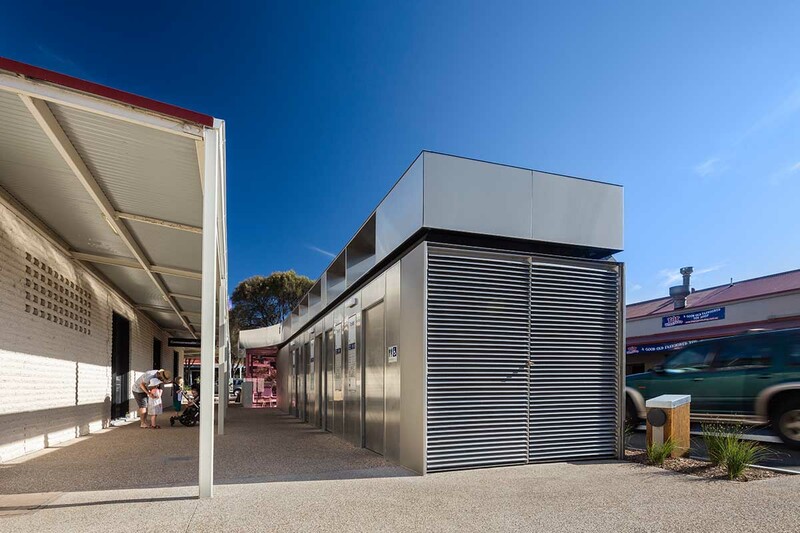 Rather than dress the prefabricated exeloo toilets up into a diminutive version of nearby buildings we took cues from a more effective model than architecture; large sculptural and public artworks. 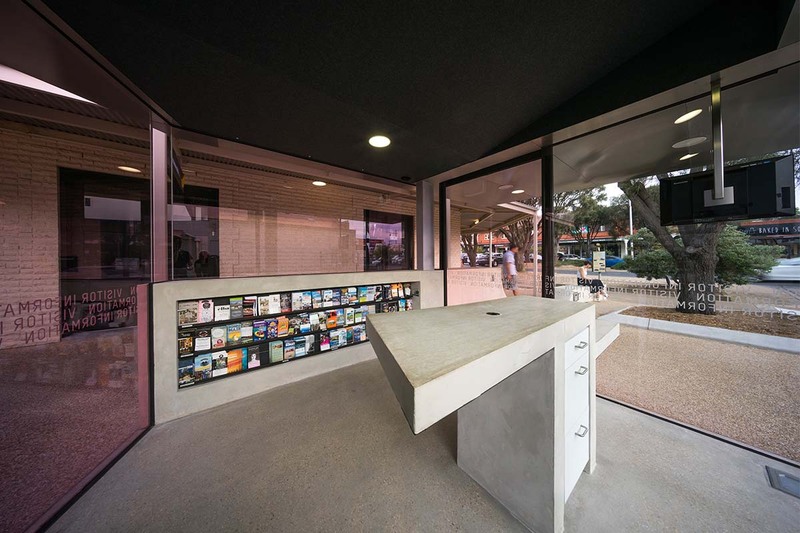 The works of Donald Judd provided ideas on how to turn the stainless steel box of the exeloo into something more – in our case the roof that covers both the toilet and the information kiosk. 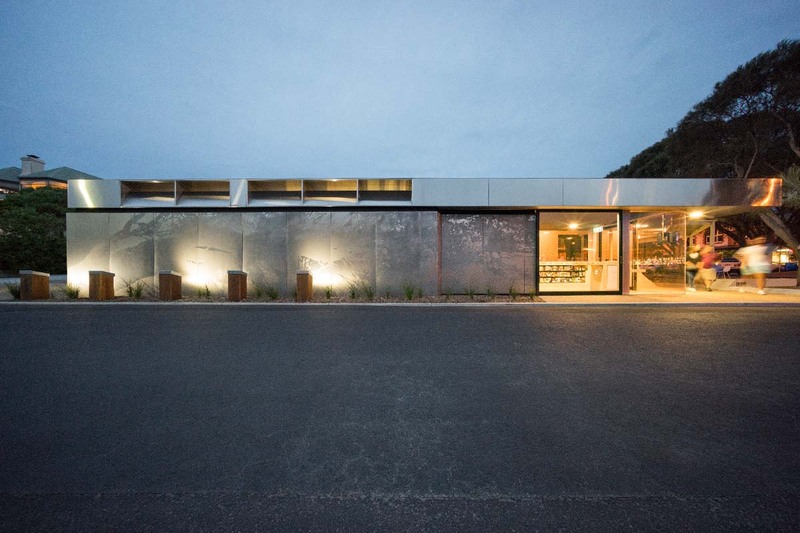 Another way to make the project bigger was in how it referenced its context, the first of which is the walls of the lime kilns that used to line the cliffs around Sorrento, making mortar for the construction of Melbourne. 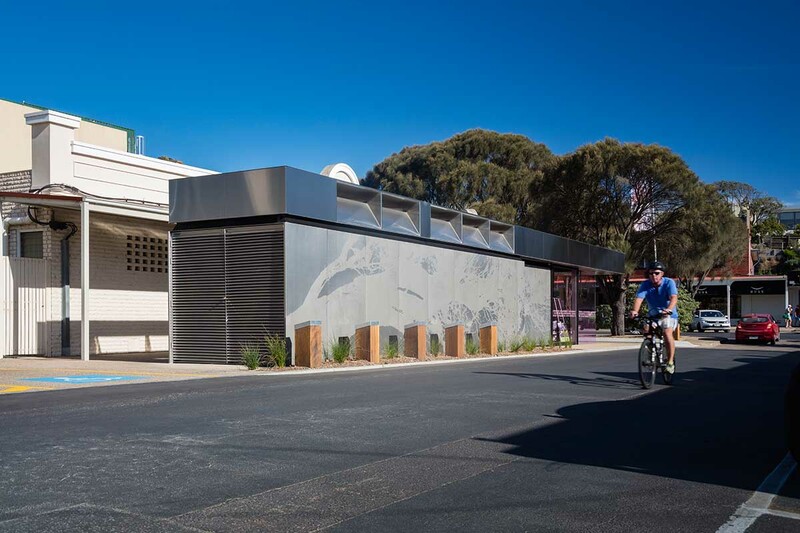 These kilns capture the history of the Sorrento in an arc along Port Phillip Bay from Sorrento to a Collins St office building. 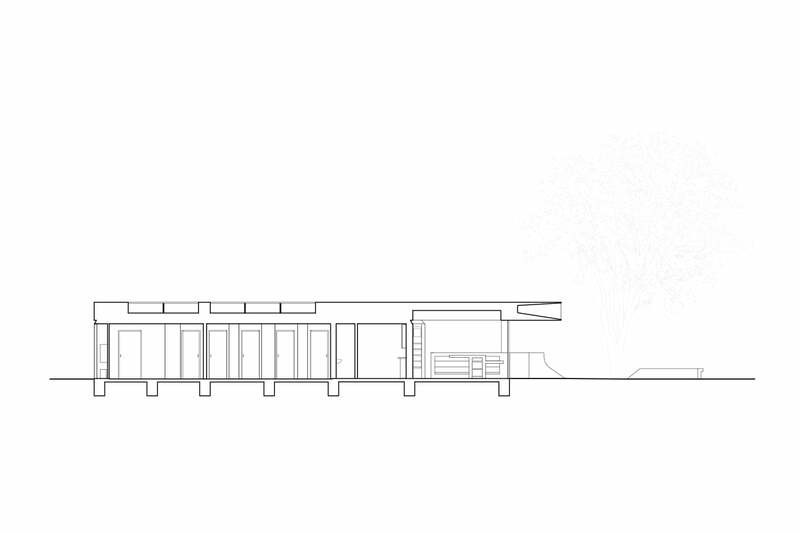 This reference was developed into two walls: a solid wall emerging from the pavement as a fictional relic, and a lightweight airy version rotated into plan and hovering above as the building’s roof. 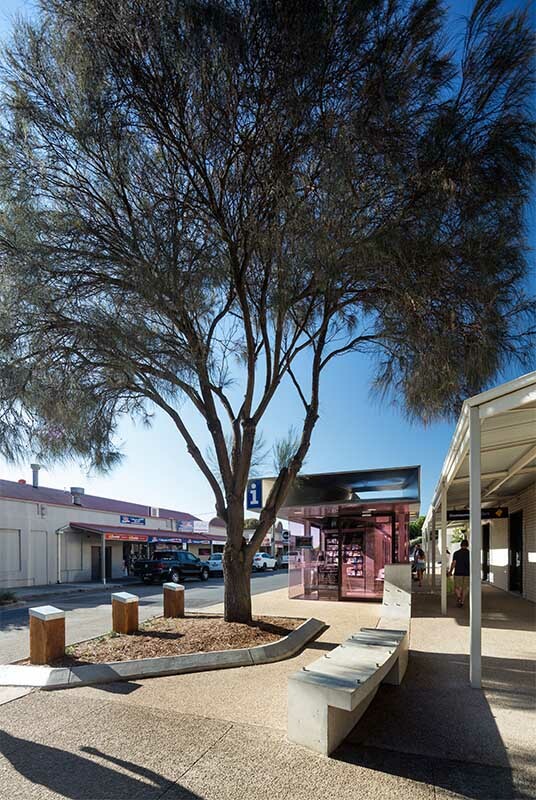 Rubbing against this abstract, conceptual referencing is a more recognisable and familiar image, the wild and twisted coastal moonah tree. 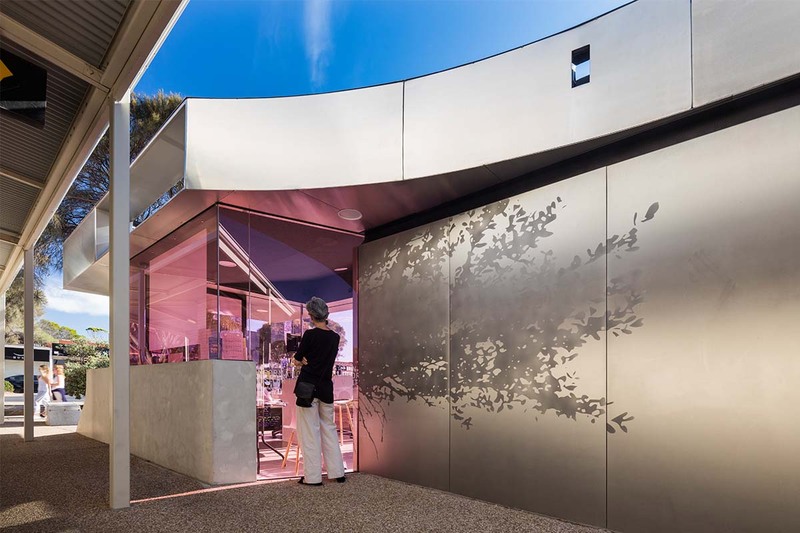 Like the kiln wall, it is Sorrento represented in things that lie beyond it’s centre. 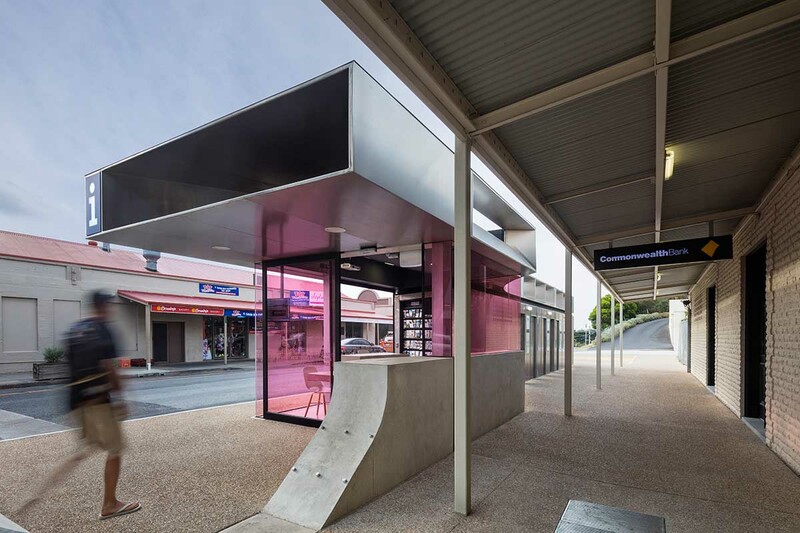 Sandlbasted into the stainless steel cladding and wrapped around the building the image shifts between the pictorial and the pattern-like. 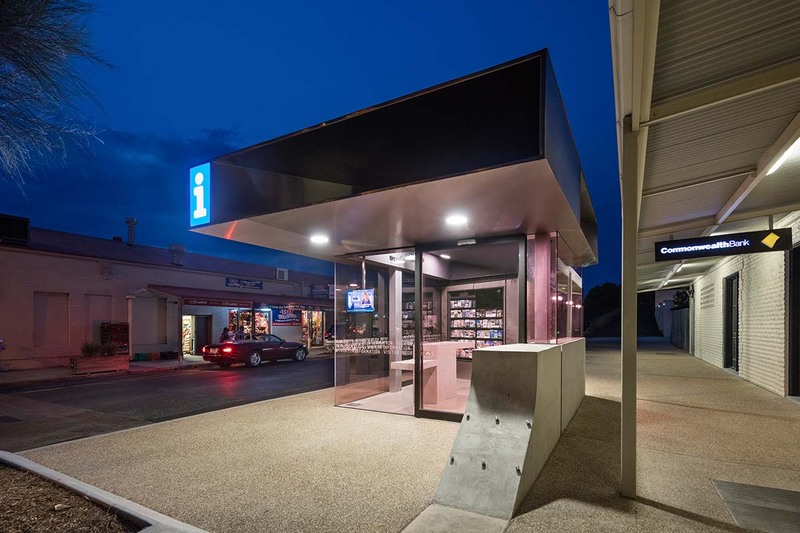 The information kiosk experiences large fluctuations in customer numbers, which means that it regularly can’t fit everyone in it. 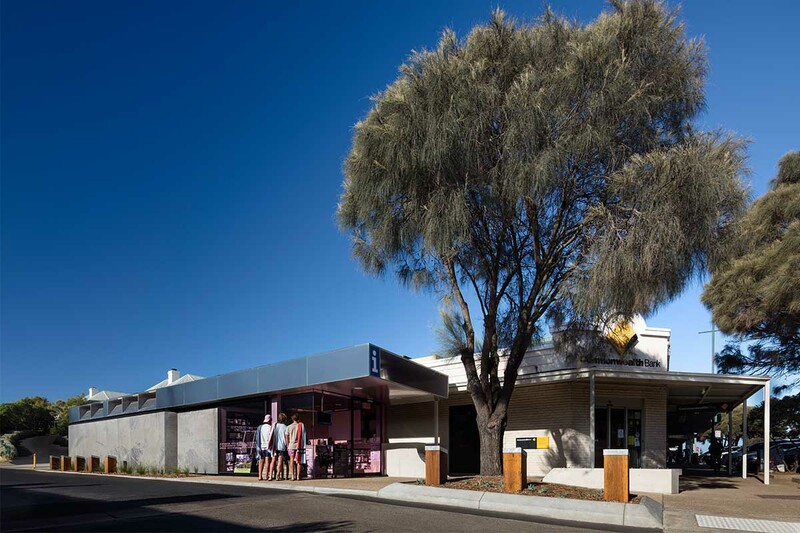 To address this, we extended the roof out to make the information centre, in conjunction with an existing shade tree, a larger interior and exterior space. 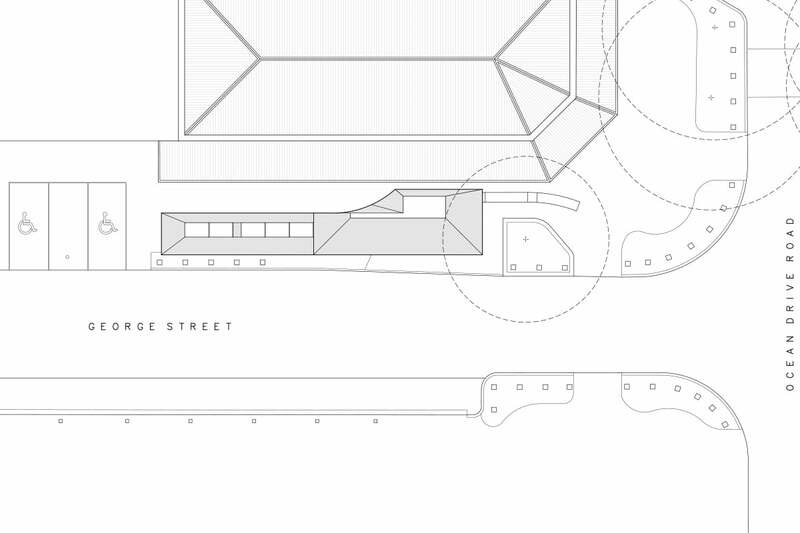 A fuller description of our conceptual intent would be to “make the building bigger….but not too big”. 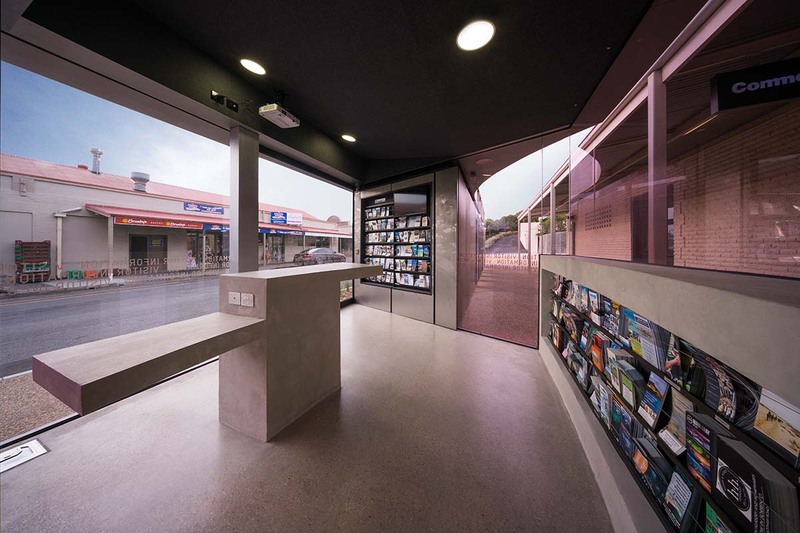 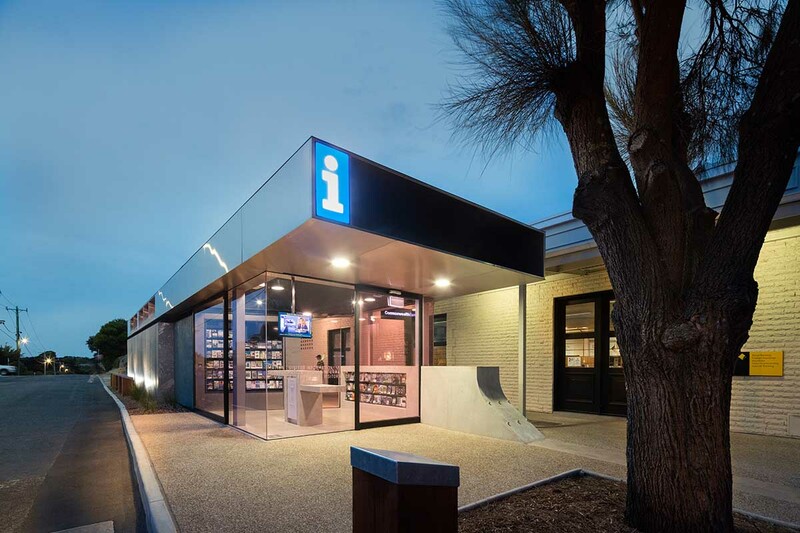 To follow a kind of urban decorum, while it is appropriate for an information kiosk and toilet building to have a civic presence it should also remain rooted within the urban design of the town – the toilet shouldn’t be more civic that the library. 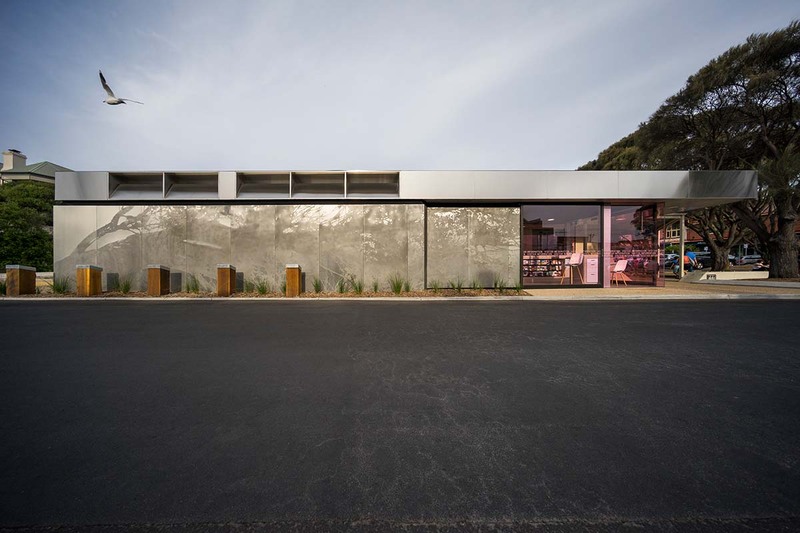 This balancing act results in a certain repose where the project’s expressive content does not quite overwhelm its smallness, nor quite separate it from its surroundings.